I’m a big fan of rotting vegetables. I’m a big fan of vegetables that have been allowed to decompose in a controlled and safe way, that is, to ferment. Fermentation is a wonderful thing, a chemical reaction that changes matter from one state into another. It’s at the heart of bread making, brewing, winemaking, cheesemaking, and much more. When things go ‘bad’, they often become very good indeed. Fermentation is one of the most glorious discoveries ever made. Vegetable fermentation is older than civilisation itself, with hints that our Neolithic ancestors practised the art. That first fermentation was probably an accident, with some salt getting mixed into some sort of organic matter which was then left alone for a while. The salt protected the food and allowed certain bacteria or microorganisms the space to kick off the process of fermentation. The result must have been a surprise, and a complete mystery. Today, fermentation is firmly established as a method of both preserving food and enriching it. 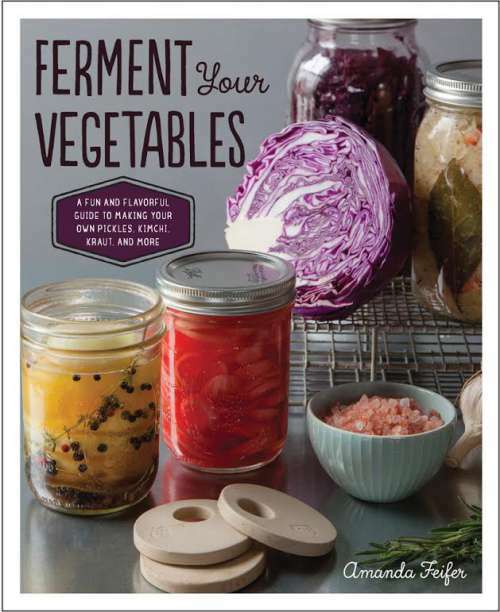 This book, Ferment Your Vegetables by Amanda Feifer, is a good place to start if you want to master the basics of fermenting vegetables to produce sauerkraut, kimchi, and plenty of other pickles and preserves. The value of this type of food can’t be underestimated. A jar of sauerkraut is little more than a shredded cabbage and salt. It costs pennies to make a huge jar. I use it all the time, and it’s become a staple part of those lunches that I have to throw together at half six in the morning before work … some carrots, tomatoes, cucumber, maybe a boiled egg or two, whatever leftover cuts of meat are lurking in the fridge, and a huge spoonful of sauerkraut make a surprisingly handsome meal. I’ve also experimented with kimchi, essentially the Korean version of the German sauerkraut with lots of added chilli. It’s intoxicating, and it changes as the fermentation progresses. The stages of kimchi are fascination … ‘fresh’, that is after a few days’ fermentation, it’s crisp and light, packed with the fizz of lactic acid, chilli and salt, but later, as the fermentation progresses, the vegetables become limp and melt into a ferocious brine that packs a devilish sting. There’s a jar in my cupboard now that’s many months’ old, that’s perfectly edible, but only a distant cousin of the fresh stuff. I may try it today.